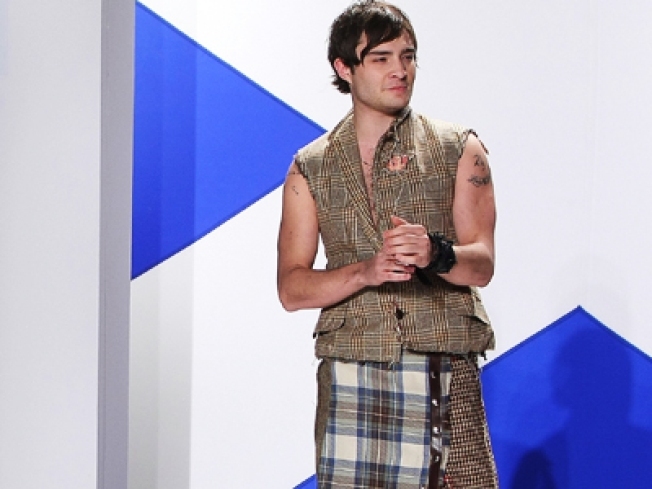 Gossip Girl's Ed Westwick, who understands that a kilt worn with confidence makes a man extra-macho. When we woke up this morning, we figured it would be just another Tuesday. Then we saw the photo feed from last night's 7th Annual Dressed to Kilt fashion show/fundraiser at M2 Lounge for the Friends of Scotland society, and as you might expect, it features a whole lot of men in skirts. Oh happy day! Among those who looked perfectly miserable and who were clearly forced into participating by their agents, wives, or Scottish grandmothers: NASCAR driver (and Mr. Ashley Judd) Dario Franchitti, NY Giant Lawrence Tynes, and ex-Yankee Bernie Williams. So, in other words, all the sports guys. Bet David Beckham would have been totally cool with it.